It was a typical Sunday afternoon. I sat around, browsing the Internet, wondering what I should bake this weekend. You see, my younger sister loves sweets. So, every weekend, I try to find something new to make for her, and the more over the top the better. 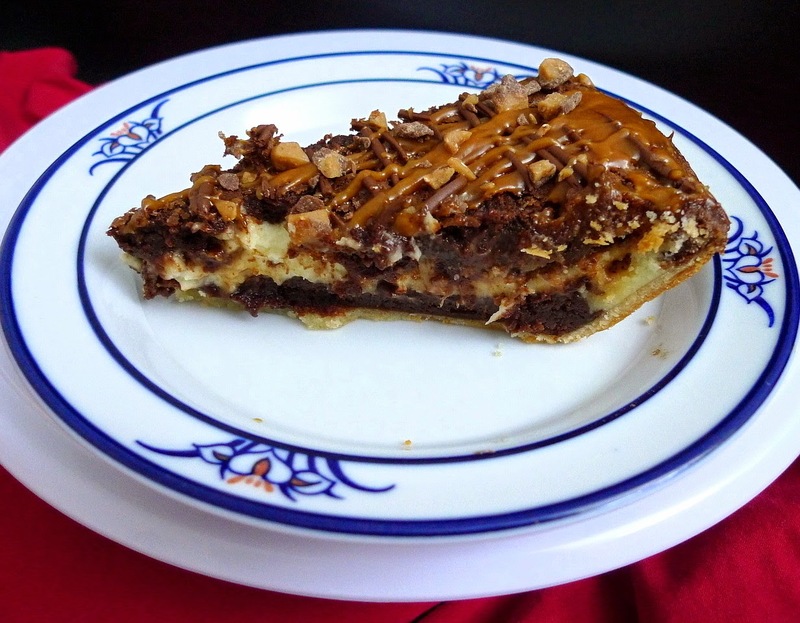 Then, I came across a recipe for Kraft's Cream Cheese Brownie Pie. Oh my gosh, that was it!!! 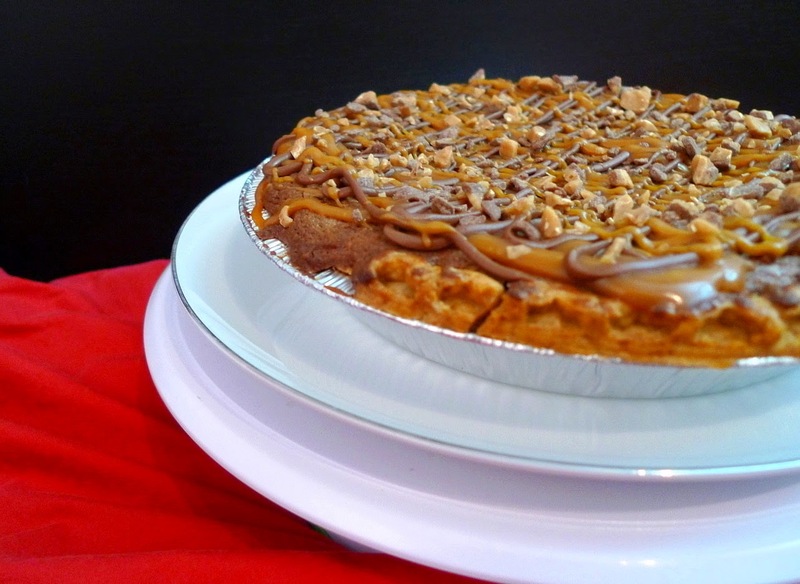 Just think of it, fudgy brownies, rich cheesecake, and pie too. A triple threat. And I just so happened to have all the ingredients, too, lucky me. I decided to dress it up a bit and make it even more decadent, because, well, why not? Either go big or go home. So, I added toffee pieces to the cheesecake layer, drizzled the whole thing with caramel and melted chocolate, and sprinkled even more toffee on top. Oh baby! Eating this is like a dream come true. 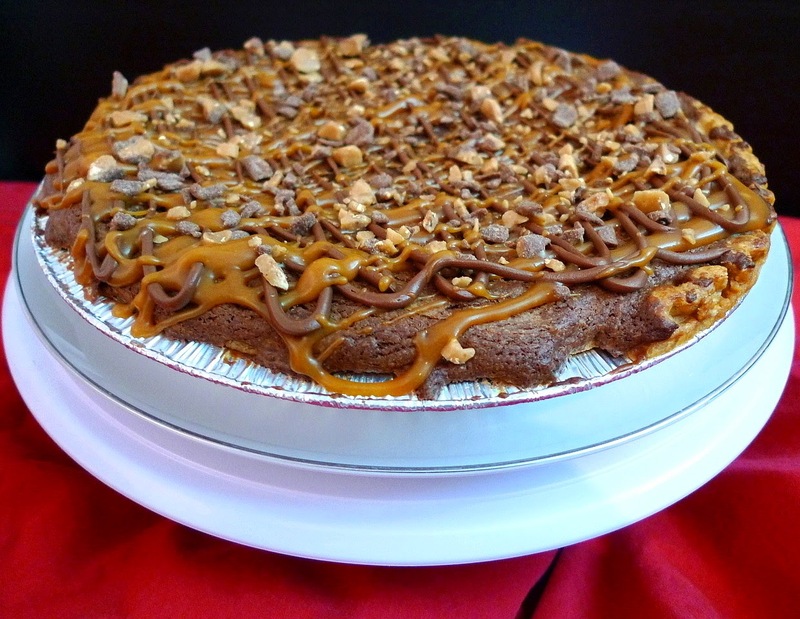 Chocolate, caramel, cheesecake, it's a party in your mouth. I promise that you will take a bite, smack your lips, and swoon in delight. I know I did. For the brownies: Melt the chocolate and butter together on 50% power in the microwave for 1-2 minutes, until melted completely. Stir to combine. Mix in the sugar and vanilla. Beat in the eggs. Mix in the flour until just combined. For the cheesecake: Beat the cream cheese with the sugar. Beat in the egg till well combined, then stir in the toffee bits. For the assembly: Spread 1 cup of brownie batter in the pie crust. Pour on the cheesecake mixture and spread evenly. Dollop on the remaining brownie batter and spread as evenly as possible. Bake at 350F for 40 minutes, or until a toothpick comes out clean. Cool completely. When cooled, drizzle with caramel sauce and melted chocolate. Sprinkle with toffee bits. Chill the fridge until ready to serve. For this month's Secret Recipe Club, I was assigned to Amanda's blog, Dancing Veggies. Oh my word! Her blog is an absolute treasure trove of vegetarian recipes. I roamed from one section of her site to another, going from recipe to recipe, in absolute glee. Quinoa Vegetable Curry, Spring Orzo, and Zucchini Rice Casserole. It all looked so good. 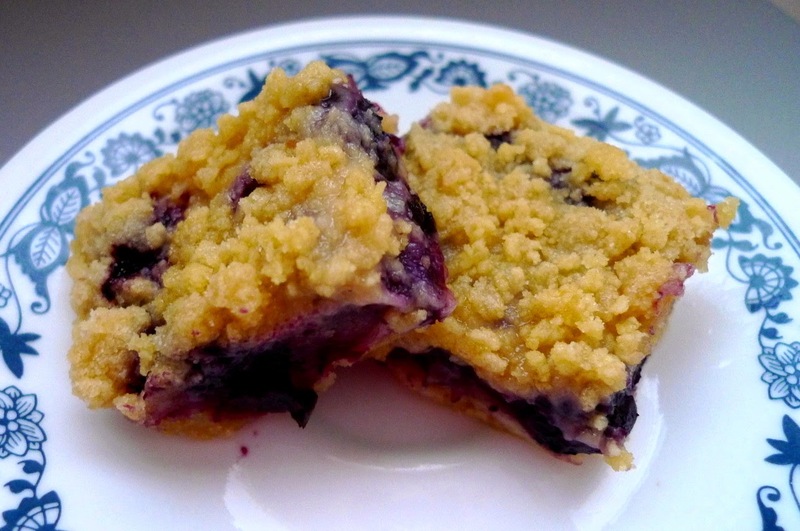 But, I was craving something sweet (when am I not), and also happened to have berries in my freezer, so I decided to make her Blackberry Breakfast Bars. The only changes I made was to sub out the blackberries for blueberries and make a little more of the dough (cause I love a lot of crumbs on top). The bars were so good. 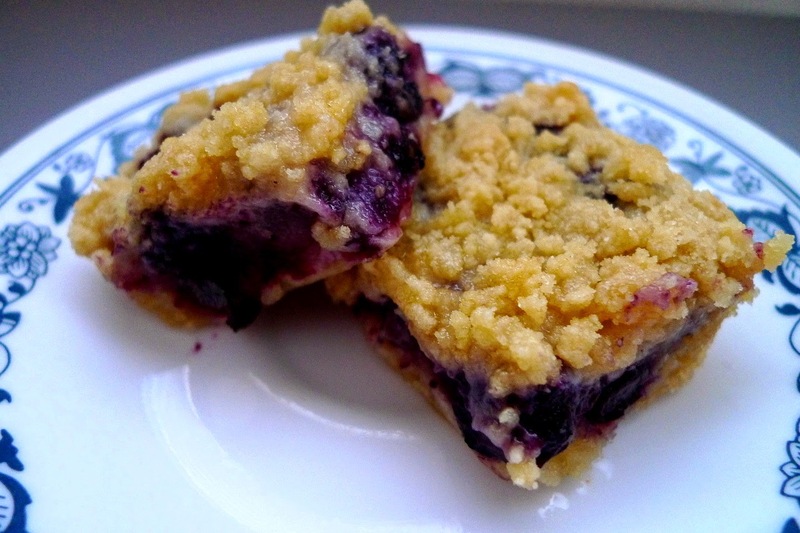 I made them on a day that was a little chilly, but these bars warmed me from the inside out with the soft, buttery crust and juicy, sweet blueberry filling still warm from the oven. A scoop of vanilla ice cream would be just the thing when eating these. I'd love to go back and try them with the blackberries too, or even raspberries, yum! These bars were the best. Preheat oven to 350F. Combine the flour, sugars, and salt. Cut in the butter until it is the size of small peas. Press half the dough into a parchment paper lined 9x13 pan. Bake for 10 minutes, then cool for 10 minutes. Combine the applesauce, sugar, and flour. Stir in the blueberries. Spread the mixture evenly over the crust. Crumble the rest of the dough on top and bake for 40 min.